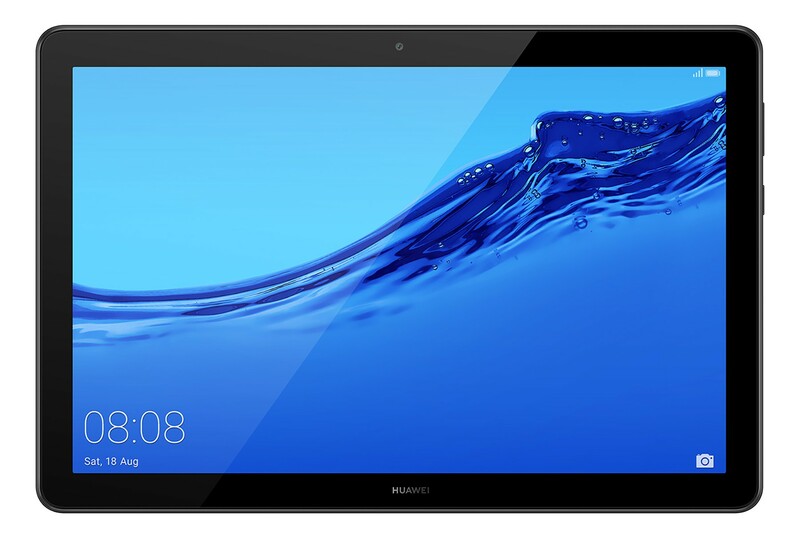 The Huawei MediaPad T5 10 is a 10.1-inch Android tablet that is quite affordable. Even though it costs around 200 US Dollars only, it features an octa-core processor and a full HD resolution. Other highlights include a mostly metal body, Android 8.0 Oreo, and the EMUI interface. Here is everything you need to know about the Huawei MediaPad T5 10 including full specifications, pricing and alternatives. The Huawei MediaPad T5 10 is a 10.1-inch Android tablet which can be classified at a lower-middleclass device. While it is quite inexpensive, it does not belong to the cheapest tablets out there. In fact, it does feature powerful hardware and a full HD screen. Like most of Huawei’s tablet, the MediaPad T5 10 features a mostly metal body. With 7.8 millimeters it is much thicker than premium devices. It has two speakers, a micro USB port, and a standard 3.5-millimeter headphone jack. You can get it in black and champagne gold. One of its highlights is its 10.1-inch display. It is an IPS panel with an aspect ratio of 16:10 and with a full HD resolution of 1920 x 1200. While the display is fully laminated, you cannot write on it with an active pen. Inside the T5 10 runs a HiSilicon Kirin 659 octa-core processor which is manufactured by Huawei itself. Additionally, we are getting 2GB of RAM and a 16GB internal eMMC storage with the cheapest version. In some markets you can also get it with 3GB of RAM and a 32GB internal storage. Other features include WiFi ac and optional LTE and GPS. Yes, you can make phone calls with the cellular version. And yes, obviously that one features a SIM card slot. While the Huawei MediaPad T5 10 has a 5-megapixel main camera on the back, the front-facing camera offers a resolution of 2 megapixels only. There is no LED flash light and the battery has a capacity of 5100mAh. The Huawei MediaPad T5 10 is shipped with Android 8.0 Oreo. Even though that version of Android has been available for almost a year, not many tablets run this version. So, actually, the T5 10 is quite up to date. Android 8.0 Oreo includes features like split-screen-view with good multitasking. Like with all of Huawei’s devices, the so called EMUI is running on top of Android. The EMUI is a skin or interface that is custom build by the manufacture. It customizes Android quite a lot and gives it a slightly different design. The user can configure the design even further. In addition to that, the tablet ships with a lot of pre-installed apps. That includes simpler ones like a tablet manager, a calculator, and notes app, but also a couple of games and Microsoft’s office suite of apps. Huawei introduced the MediaPad T5 10 in August 2018 in Europe and other markets should follow soon. Depending on the country and model, prices start at 199 Euros or 229 Euro. The tablet should cost around 200 US Dollars in the United States and Asia. In Europe it went on sale at the end of August 2018. There are a couple of interesting alternatives to the Huawei MediaPad T5 10. A direct competitor is the Amazon Fire HD 10 (review) which offers the same full HD resolution and a similar performance. However, it is much cheaper but is not shipped with the Google Play Store out of the box. If you are looking for a much more powerful device, you can check out the Huawei MediaPad M5 10 (review). While it costs almost twice as much, it has a much higher-resolution screen, a much faster processor, four speakers, and features like a fingerprint sensor. Another alternative is the Huawei MediaPad M5 Lite 10. It features the same internal hardware and display as the MediaPad T5 10. But unlike its cheaper brother, the M5 Lite 10 has four speakers, a fingerprint scanner, and an optional stylus. In case you are looking for a much cheaper tablet, you can also check out the Huawei MediaPad T3 10 (review). That is the predecessor that was released in 2017. It is a lot cheaper but offers weaker hardware too. For example, it has an HD resolution only. The Huawei MediaPad T5 10 is a very good entry-level tablet. Even though it is quite affordable, it offers a good 10.1-inch full HD screen, Android 8.0 Oreo and, considering the price, a great performance. Premium features like a fingerprint scanner are missing. But overall it is a great value.